I’m on the verge of just dropping this show, to be honest. While I think it’s a sweet little story about love and friendship and overcoming tragedy and time travel and crap, I can’t help but feel the characters of this story are all too weak. The main love triangle is already pathetically dull, and that’s mainly at fault of the main heroine, Naho. She’s just not a strong character, physically or emotionally, so how could she possible carry the weight of this story on her shoulders? Naho’s well-mannered and overwhelmingly kind, as well as prudish, unobservant, and anxious for the lamest of reasons. Now, this might’ve worked had the other supporting characters been there to push her forward. Instead, they’re no better than placeholders for real friends. 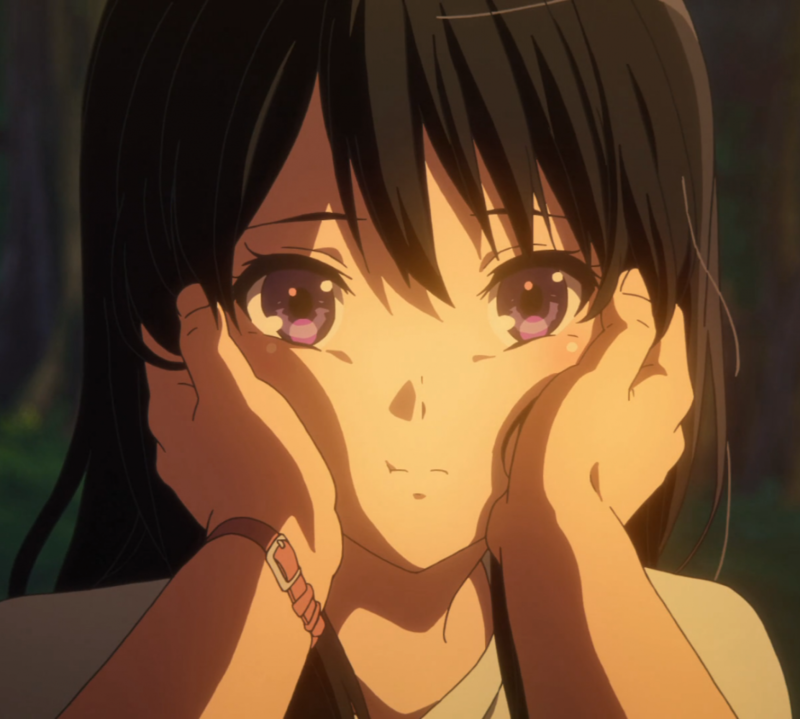 Naho being an anxious mess could easily be part of what makes this show interesting rather than just a drinking game based on how many times she blushes over something stupid. If we saw this story over the shoulder of her friends playing matchmaker, we could share our disdain of her stupid mistakes with the characters trying to help her. In my version of this story, only the support characters would receive letters, and they would be able to converse among themselves from the start. Now, when information from the future is brought into a story, there needs to be a reason for the characters who hold the information to not tell anyone. Usually the explanation is something along the lines of “you wouldn’t believe me if I told you”. That, or magic. Either way it’s cliché. So here’s my way around that, my explanation for keeping the letters a secret: They’re sabotaging Suwa and Naho’s marriage. By keeping Kakeru alive and in love with Naho, Suwa’s chance at love might have to be destroyed. They decide it’s better to just keep Suwa out of loop, but perhaps this is a betrayal of his trust. The group will eventually question themselves and wonder if they’re not giving Suwa enough credit, leading to a dramatic confrontation down the road. All I know is, I want the show to be more about the supporting cast observing the main three, developing their own characteristics and maybe even relationships along the way. They need to be smarter and have genuine dialogue, sometimes meaningful and sometimes comical, but always in reference to what’s happening at the time. I’m really sick of the small talk I’ve seen (or rather heard) from this show so far, and just wish that the things these characters say would at least be entertaining, if not ACTUALLY important. Another thing that I’d fix in this show is making Kakeru’s mother a character and giving us some time with her before she dies, but I’ve written about that before in Issues With Orange post. This Art Club Has A Problem! doesn’t really have a problem, but I’m using it as an example anyway. I like the show. I think it’s a pretty decent comedy with some really sweet moments and delightful characters…but I think I’d like it more if it went in a slightly different direction. First off, I’m not too fond of the fact that it’s more of a sketch comedy show rather than a full length feature. Wacky misadventures take place in every episode with varying run lengths for each segment. This gives me the sense that the show is more about being fun and silly rather than actually developing its characters and giving a worthwhile storyline that reaches a satisfactory ending. I can do with the occasional 3 piece episode showcasing the wacky side mishaps of characters. This often allows for some more experimental moments, things that don’t have any relevance to the main plot but make it feel like the characters have a life outside of just being a member within a group or story. However, when a show is nothing but that, it starts to feel like the only reason it exists is to be cute and make me laugh, and while there’s nothing wrong with that it does tend to come at the cost of having the characters/show feeling unmemorable. What I’d really like to do with this show is change up Usami a little. Instead of constantly being shocked and turned off by Uchimaki’s otaku nature, I’d like to see her actually try to delve deeper into the culture herself. Sort of like Oreimo, I want her to begin to understand what’s wonderful about being otaku, and start to see why Uchimaki is how he is (as well as get him to notice her more too). That, and a normal run length I think would suit this show well. AnimeOrangeThis Art Club Has A Problem! Orange is stagnating and the fault does sit mostly with Naho (although it is more how Naho is written). Basically anything that would give us a bit more development than waiting for Naho and Kakeru to make progress would improve on this.